Our friends over at Quantum Mechanix let us know some additional details about their upcoming Star Trek Master Series 1/6th scale Spock and Kirk figures. Both figures will be in stock and ready for shipping in July 2016 and will retail for $179.95. Each will receive an exclusive version with additional items via the Quantum Mechanix retail site. Read on to check out all the fine details for each release! At Toy Fair 2016, we were treated to a couple of fantastic looking new Star Trek: The Original Series 1/6 Scale Figures from Quantum Mechanix. Now we have a few official, high resolution, photos of the figures. 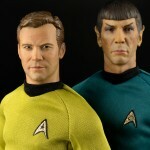 The Captain Kirk and Spock 1/6 Scale Figures will stand roughly 12″ tall. They will feature approximately 30 points of articulation. The crew at QMX worked to achieve screen accurate likenesses of both William Shatner and Leonard Nimoy as well as ensuring the outfits matched those from the television series. The figures will include three sets of interchangeable hands. The figure will include show themed accessories with moving parts. Kirk will include a phaser, a communicator and a translator. Spock will include a phaser and a tricorder. We’re awaiting final details, so these items may not be final. We’ll have more on these figures as it becomes available. You can see new photo after the jump. The QMX display at Toy Fair 2015 had a nice variety of items. These included an all new Captain Picard 1/6 Scale Figure! They also had assorted Firefly, Buffy the Vampire Slayer, DC Comics, Ghostbusters and more products. See all over 90 photos by reading on. 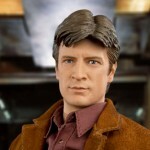 QMX has revealed a new Captain Malcom Reynolds 1/6 Scale Figure from the cult favorite TV series Firefly. This is the very first 1/6 scale figure coming from QMX. 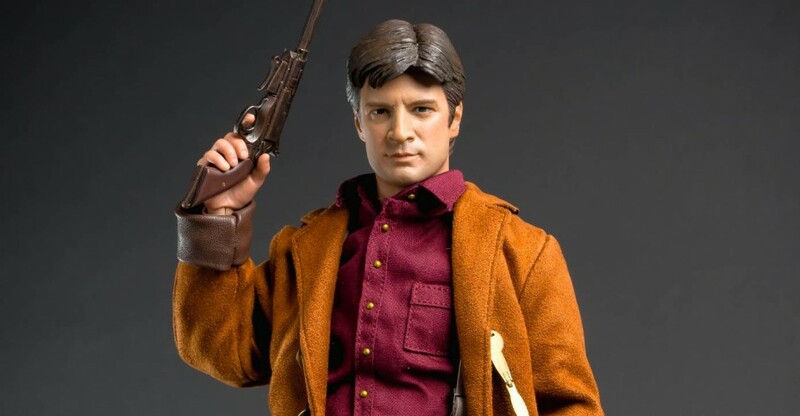 Judging by the details and near perfect likeness of Nathan Fillion, they clearly know what they’re doing. A QMX Online Exclusive version will include a Lassiter Laser Pistol and an interchangeable hand to hold it. The figure is due out in the 3rd quarter of 2014. It’s priced at $179.95. Read on for a few images and much more info.